A survivor of the fossil age, the ginkgo or maidenhair tree is the sole member of its genus and dates back at least 200 million years. The trees are either male or female and only flower when in close proximity. The edible seeds are used in traditional Chinese medicine for some types of asthma, while the leaves have become popular in the West for circulatory disorders. Take 20–60 drops (1–3ml) up to 3 times daily for diseases involving the peripheral circulation, or for cerebral arteriosclerosis in the elderly. Take 60 drops–1 tsp (3–5ml) 3 times daily for cardiovascular system disorders. It is generally combined with periwinkle (Vinca spp.) and lime flowers for circulatory problems, or melilot for venous disorders. Drink 1 cup of tea made from 3–4 seeds to 1 pint (600ml) of water 3 times daily for wheeziness, persistent coughs, or asthmatic conditions. 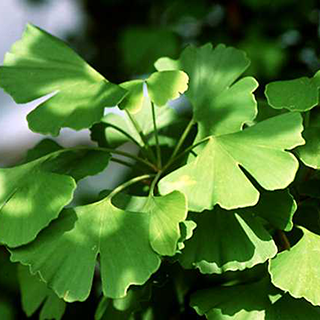 Ginkgo can be combined with coltsfoot and mulberry leaves (Morus spp.). Widely available and generally recommended for poor circulation, varicose veins, or memory loss. Most commercially available trees are grown from cuttings from male trees; so female trees can be hard to find. Prefers fertile, moist, but well-drained soil in full sun. Grow from ripe seeds collected from a female tree in autumn and plant in a cold frame, or take semi-ripe cuttings in summer. Avoid pruning. Collect leaves and fruits in autumn.